Statement from Tony Mason, President and CEO of the Indianapolis Urban League, on Indiana’s Refusal to Pass Comprehensive and Inclusive Hate Crime Bill. ” Today, we are greatly disappointed in Indiana’s Senate Corrections and Criminal Law Committee for failing to vote to pass an inclusive hate crime law, ultimately allowing it to die in Committee. This law was largely supported by Hoosiers, who came together with business and community leaders to ensure this law would pass. the Indiana Senators failed to listen to the majority, instead succumbing to those who opposed protections for LGBTQ+ Hoosiers. While we worked to find common ground with the opposition, we felt the inclusion of the LGBTQ+ in the proposed list of identified characters was vital, and refused to compromise on a bill that did not include them. Please see below to review the original statement from the Central Indiana Alliance Against Hate. Today, with the lack of vote in the Senate Corrections and Criminal Law Committee, SB 418, a bill to pass a hate crime law in Indiana, died in Committee. Despite statewide polls prior to the session showing 65% of Hoosiers support the passage of hate crimes legislation, and calls from businesses and economic development leaders, and nearly a hundred community organizations, a majority of Indiana Senators listened to only those who oppose protections for LGBTQ+ Hoosiers. The Central Indiana Alliance Against Hate is profoundly disappointed that for another year, issues that largely centered around the inclusion of LGBTQ+ Hoosiers in a proposed list of identified characteristics, has prevented the Indiana Senate from passing an identical bias crimes bill to the one they passed in 2016. The Alliance worked with Senators to try to find compromise language that would address concerns, but in the end we felt it was crucial to include a list of identified characteristics, as 44 out of 45 other states have utilized. However, the opposition would not agree to anything that continued to include sexual orientation and gender identity, identified characteristics the Alliance believes must be part of any hate crime law. It is incomprehensible that despite escalating examples of hate crimes in Indiana and at the national level, and despite national attention to Indiana’s lack of a hate crime law, Indiana is determined to continue to wear its badge of defiance by not providing full protection to persons commonly targeted by hate, including our LGBTQ+ Hoosiers. While this is a setback, we are not going away. Advocates will continue to come back to the General Assembly for as long as it takes to change hearts and minds and finally help legislators see that it is imperative that we clarify our code, and strongly say as a state that we do not tolerate hate. 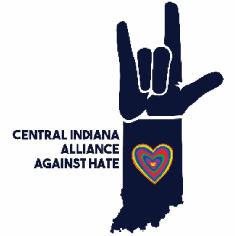 For more information or updates, visit the Central Indiana Alliance Against Hate’s Facebook page. Read the Alliance’s Fact Sheet for more answers to frequently asked questions about a hate crime law.